Bearing in mind that architecture is a form of art, whoever heard of a Picasso or Monet being destroyed to make more space in an art gallery? Brighton Park, a subscription pleasure garden, was laid out for a Mr Armstrong in 1824. Thomas Attree, the son of William Attree, a prominent local solicitor, purchased the park soon after. Attree employed Charles Barry (later Sir Charles, after designing the Houses of Parliament) to plan a series of detached villas in their own grounds around the park. Brighton Park became Queen’s Park in 1836 after William IV and Queen Adelaide patronised the park’s spa and finally opened to the public in 1892 after being donated to the corporation. Only one of the proposed villas ever materialised which was built just north of the park in large grounds. The Attree Villa, completed in 1830, was built in the Italian Quattrocento style with a central loggia of three round-headed glass doors and arches supported by slender columns. It had a shallow roof, broad eaves, plain walls and a balustered terrace. In 1863, the Attree estate, including the park, was purchased by George Duddell. The villa remained vacant for twenty years after Duddell’s death until opening as an Xaverian college for Catholic boys in 1909. The college closed in 1966 and the building became dilapidated. The villa was one of the earliest of its style and was unbelievably demolished in 1972 despite being Grade II* Listed and classed as outstanding by the Historic Buildings Council. Carn Court, now standing in its place, adds insult to injury. Few relics remain, though it is still possible to see the villa’s old walls, gateposts and gazebo. The ten-sided tower on the junction of Tower Road and Queen’s Park Road, is thought to have been the villa’s water tower though some theories suggest that it was a sewer vent or simply a viewing tower. 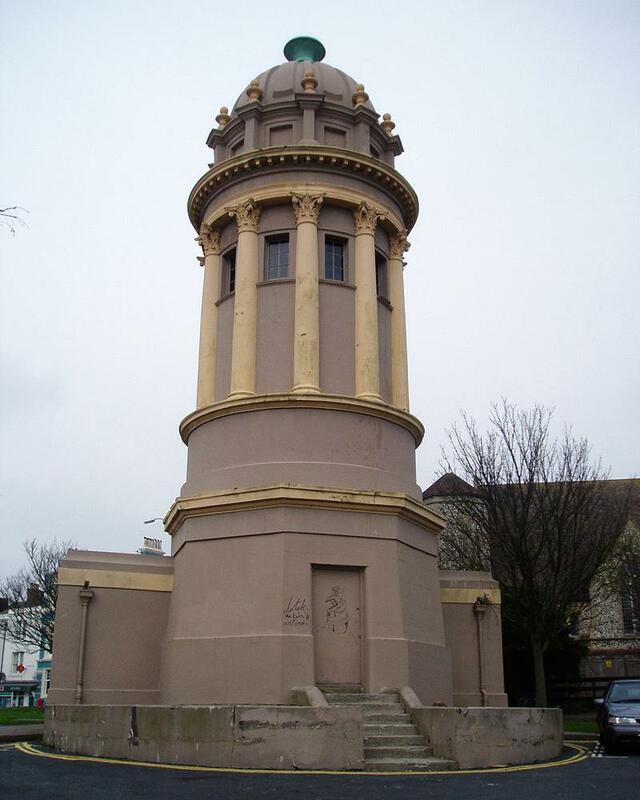 The Grade II Listed structure, with magnificent Corinthian pillars and cupola, is known as the Pepper Pot or Pepper Box due to its shape. Duddell used it for printing the Brighton Daily Mail and it was certainly used an observation point during WWII. It is now council-owned and has since been used as a scout headquarters, artist’s studio and public toilet. I can only guess at future uses of the Pepper Pot. A community centre, an observation tower for tourists, a restaurant perhaps? Pepper anyone?